Taken with Canon EOS 5D, Mitutoyo M Plan Apo 10x microscope objective on bellows, ISO 50, flash, paper cylinder diffuser, stacked with Zerene, mix of PMax and DMap method. Wow! The large version over at Flickr is stunning. You even got all the longitudinal striations on the large bristles. Very nice! Bitte? No tube lens, have we been wasting our money??!! No, you did not, a tube lens is included ... the $ 9 Morfanon. Wow... this is great work! Posted: Thu Nov 17, 2011 11:18 pm Post subject: Awesome Shot. Amazing sharpness and color, likes it thank for sharing. Rik, Chris, Martin & Madmacro, many thanks for your comments. Charles, when I started with this kind of photography I've read all your pdf-articles more than once ... Thank you for publishing your knowledge! I love the way the most innocuous looking little fly can become so amazing when viewed through a decent objective! Beautifully done! 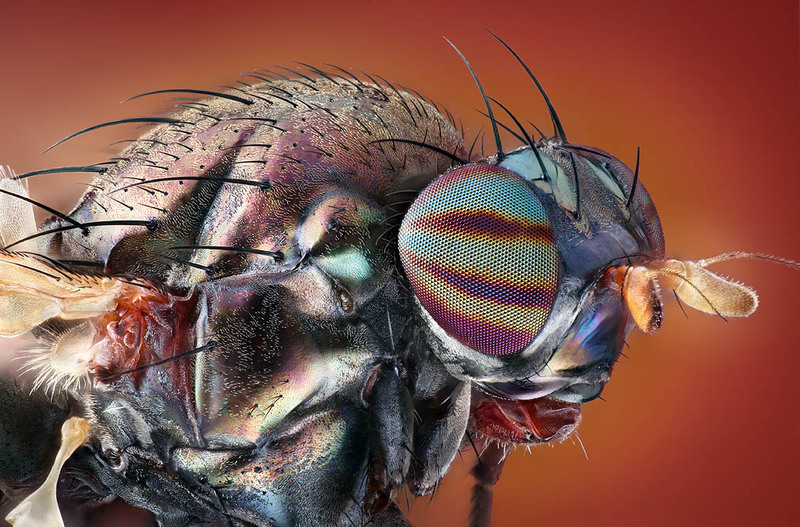 I especially love the lighting and the balance of the background with the fly's colors and shadows. Exceptional detail in an exceptional photograph, well beyond my ordinary language abilities! Impressive lighting and color contrast! At the risk of sounding redundant, beautiful detail and perfect background! I m sure that you will did a nice job, when you will get portrait photography job because you take a nice shot of this insect.